Max McLean’s stage production of C. S. Lewis’ “The Screwtape Letters” played to sell-out crowds in Houston this past weekend. McLean’s voice, coupled with his robust acting abilities, made for a superb Screwtape. The sheer power and enormity of Lewis’ work was somewhat diminished, however, by the fanciful set and the playful Toadpipe (respectably played by Karen Wright), Screwtape’s secretary. McLean and Fiske risk trivializing Lewis’ work with these distractions. C.S. Lewis fans don’t need it and those looking only to be amused may possibly leave saying “So what?” Only needed for their brilliant adaptation is a chair and a spotlight; Lewis’ profundity to penetrate the minds and spirits of the audience will do the rest. The Houston audience comprised two worldviews: the intellectual and the Christian. From the feedback during the post-production informance with McLean, it appears the intellectual was grateful for a comfortable characterization of the incredibly evil Screwtape, with lots of tittering and snickering at the protagonist’s observations. Regarding the Christians’ expectations (trying to avoid falling into the trap of spiritual pride that Screwtape aptly pokes fun at when speaking of Christians), I will say that their worldview is not of this world. Subsequently, the straining of Lewis’ work may have left them, shall we say, hungry for more. 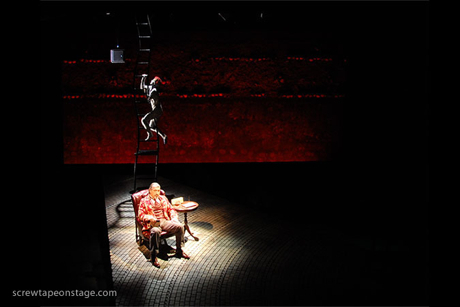 “Screwtape” was produced by The Fellowship for the Performing Arts and Walt and Anne Waldie and William and Bridget Coughran. The production was inspired by Tony Lawton’s stage adaptation. For more information, http://www.screwtapeonstage.com/aboutus.